"I’m a big fan of Nietzsche’s thoughts on the role of art, especially in The Birth of Tragedy. Nietzsche argues that we need a balance of order and disorder, and that these things compliment one another. Apollo, on my right leg, represents this as a patron of art: he was a symbol of reason and pragmatism for the Greeks. Dionysus, on my left, was also a patron of the arts, the god of wine and theater, and often represented disorder or a detachment from reason. I think in writing poetry, there’s a liminal space that we have to balance when we commit ourselves to the poem while also detaching ourselves from it in order to let it do its own thing. So often in life have I been Dionysian and craved the Apollonian, and vice versa. Having each god face each other on each leg was a sort of tribute to this. These pieces are modeled after Greek pottery from the 5th Century. 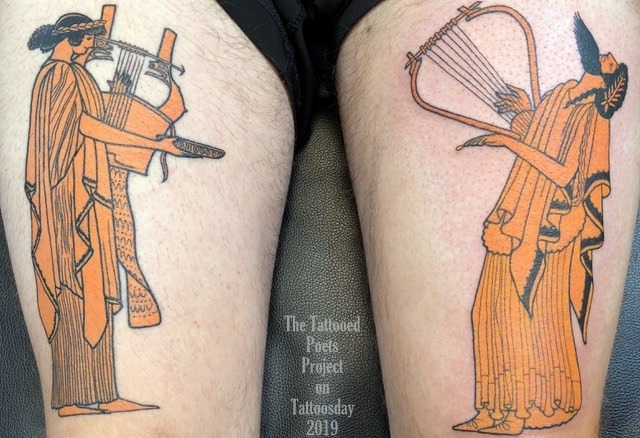 Shoutout to Nigel Hirschi (@nergent) at High Noon Tattoo (@highnoontattoo) in Phoenix, who loves the weird, Greek-influenced art of Aubrey Beardsley, for tattooing these, along with at least 10 other pieces on my body. Some of my tattoos mean something. Some of them mean I just liked Nigel’s art. Order and disorder!" like nectar seeps to spittle. Flowers get under my skin. like bulbs breaking for photos. spines. For shades, needles like combs. Yorick’s grin is in my skin. engraved on my collar bone. Cody Wilson teaches English and Creative Writing in Arizona. He has an MFA from Queens University of Charlotte. His chapbook, Nobody is Ever Missing, was published by Tolsun Books. Some of his work appears at Juxtaprose, The Southampton Review, Juked, Emrys, New Ohio Review and Arc Poetry Magazine. Thanks to Cody Wilson for sharing his tattoos and poem, helping us launch our eleventh year of the Tattooed Poets Project on Tattoosday!